Travis has a unique job for a llama. He's a beloved companion animal for a whole household of people who love him. And he's the subject of a new video released by National Geographic on Travis's special role at the Life Center of Nashoba Valley, a nursing home in Massachusetts. 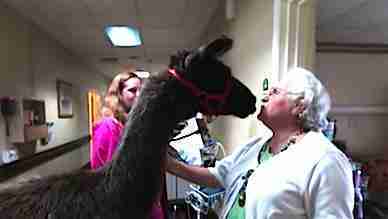 Travis and his llama friend V.J. live in a field belonging to the nursing home. 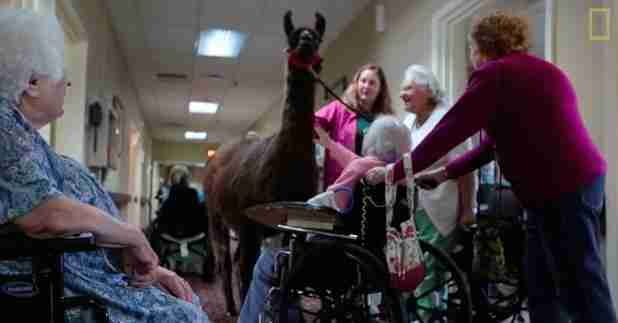 When Travis goes to work, he's led into the nursing home and surrounded by cries of delight. People wheel their wheelchairs to the door frames of their rooms to watch him go by. Some who have trouble standing try to reach up to him. "How are you doing, Travis?" one resident says, greeting him as he comes along. "You are beautiful." 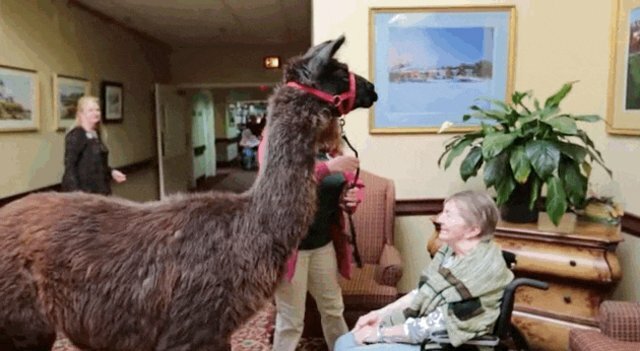 "Animal-therapy programs are said to decrease agitation in many nursing home residents and to increase participation," National Geographic explains. "The animals are sometimes able to bring the residents out of their shells in ways that previously seemed impossible." Travis isn't the only one. 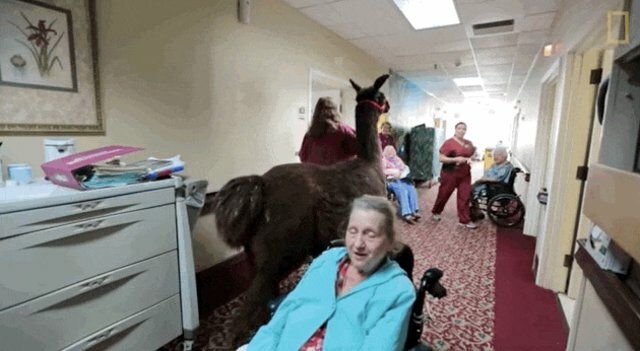 Chickens, dogs, cats, fish and other animals across the country visit nursing homes as part of animal therapy programs that help bring joy to the elderly. Does Travis know just how much he means to the people at the nursing home? Maybe. Maybe not. But everyone is surely feeling the love.